UNITED STATES: The 800MW Vineyard Wind project off the coast of Massachusetts will generate electricity for $65/MWh over the 20-year lifetime of the project, according to a letter recommending its approval. A 400MW first phase of the project, with an expected commissioning date of 2022, will come in at $74/MWh, a letter from the state’s Department of Energy Resources (DRE) to its Department of Public Utilties revealed. The price for the second phase of the project will be $65/MWh. Both prices will be subject to an annual 2.5% increase from 2022. A footnote in the letter stated: "The 20-year average cost of the two long-term contracts is $84.23 per MWh in levelised nominal dollar terms. This is equivalent to a levelised net present value price in 2017 dollars of $64.97 per MWh." Each phase will be covered by 20-year power purchase agreements (PPA) with three utilities operating in Massachusetts: National Grid, Eversource Energy and Unitil. It is believed these prices include transmission costs. Following the conclusion of contract negotiations with Massachusetts’s electric distribution companies, Vineyard Wind’s CEO Lars Thaaning Pedersen said using federal tax investment credits (ITCs) and a long-term PPA enabled the developer to reach the price. He added: "This long-term investment and commitment to Massachusetts will stimulate growth, economic development and acceleration of an emerging offshore wind industry in the United States." The letter further stated the contracts between Vineyard Wind — a 50:50 joint venture (JV) of Copenhagen Infrastructure Partners (CIP) and Iberdrola subsidiary Avangrid — are expected to reduce consumers’ energy bills by between 0.1% and 1.5%. Vineyard Wind was awarded its total 800MW capacity in Massachusetts’ request for proposals (RfP) in May 2018. Elsewhere in US offshore, developer Deepwater Wind launched month-long geophysical and geotechnical surveys off the coasts of Maryland and Delaware in preparation for the 120MW Skipjack wind farm. 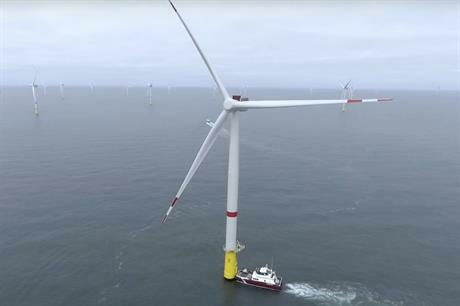 The surveys are required ahead of construction, and data collected will help inform the design and exact location of the turbines and cables, the developer said. Deepwater Wind plans to spend $25 million on a new steel fabrication facility in Maryland and $13 million on port improvements in the Greater Baltimore area. It also plans to set up a permanent operations and maintenance (O&M) facility near Ocean City, the company stated. Skipjack is due to be built at a site 30 kilometres north-east of Ocean City, which is located on the Maryland side of the border with Delaware to the north. Construction is planned to start in 2021, with commissioning expected to follow in 2022.